DIM by Source Naturals seems to work well, I feel great about an hour after I take it. I only used one bottle of DIM by Source Naturals but I do feel it worked and I will be buying more. Ive used DIM for a few months after seeing it in an ad to help metabolize healthy estrogen rather than unhealthy. I think it does that. Both men and women can take DIM. DIM Tablets from Source Naturals® may maintain healthy levels of estrogen and testosterone hormones in the body. Diindolylmethane (DIM) is a natural substance produced in your body during the breakdown of foods‚ which contains the nutrient indole-3-carbinol. Its supplements help meet deficiencies and offer a range of health benefits. 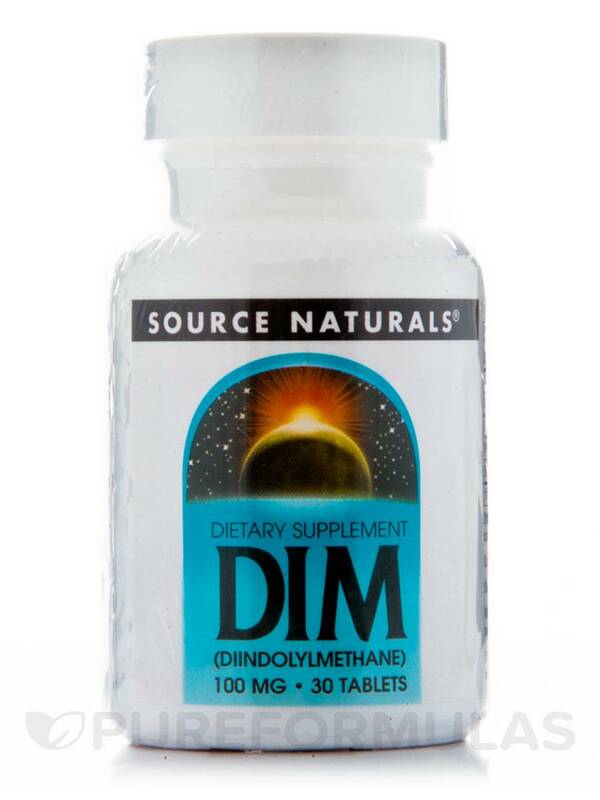 DIM could potentially inhibit the growth of harmful cells and support the health of your breasts‚ and uterine. It may also promote heart health‚ maintain brain function‚ and aid weight loss. DIM in this dietary supplement from Source Naturals® could potentially lessen prostate conditions in men‚ promote lean body mass‚ and boost libido. Phosphatidylcholine reportedly reduces anxiety and age-related memory loss‚ strengthens immunity‚ and boosts circulation. It may also support heart health and alleviate liver conditions. Black pepper fruit extract may restrict the multiplication of harmful cells‚ promote digestive health‚ and relieve respiratory discomfort. Vitamin E in DIM Tablets from Source Naturals® could potentially support the health of your heart and blood vessels‚ alleviate PMS and menopause symptoms in women‚ and prevent the growth of unwanted cells in breasts. Other Ingredients: Microcrystalline cellulose‚ magnesium stearate‚ silica‚ and stearic acid. Contains no yeast‚ dairy‚ egg‚ gluten or wheat. Contains no sugar‚ starch‚ salt‚ preservatives‚ or artificial color‚ flavor or fragrance. Do not take this product if you are pregnant‚ may become pregnant‚ or breastfeeding‚ or are taking immunosuppressive therapies. DIM 100 mg by Source Naturals seem to be doing their job with no adverse side effects. I am happy with them! I just started DIM 100 mg by Source Naturals a week ago after reading the reviews. I am 56 and I used to fan at church a lot when no one else was. Also my mood does seem more relaxed as I used to yell and get emotional over things or issues at home. Easy to take and the price is good. I have noticed good results so far. DIM by Source Naturals works just as it says and I will buy again. Tried several different brands and formulations for menopause symptoms. One 30 tablet bottle of DIM all symptoms gone. I tablet only at night. I highly recommend DIM. DIM helps with my estrogen problem.